Take 371 South. 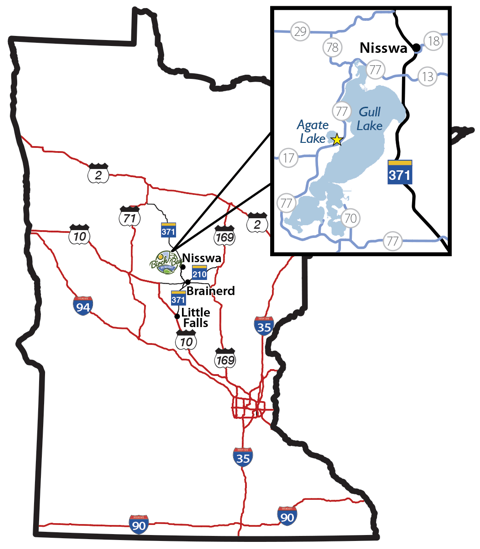 Just south of Nisswa, at the first stoplights, take a right onto County 77 (Bar Harbor Road). Go 8 miles. Turn Right onto Sandy Point Road - Birch Bay will be straight ahead. Take 10 East past Motley. Just before Pillager, turn left on County Road 1. Go approximately 5 miles, turn right onto Country Road 15. County Road 15 ends at County Road 77, turn left and go 1/2 mile. Turn Left on Sandy Point Road - Birch Bay will be straight ahead. Take 35 south toward Minneapolis. Take Hwy 210 west exit just south of Black Bear casino. Follow 210 all the way into Brainerd. At Kohl's department store take a right on 371 North. At the second stoplight after Cub and Gander Mountain take a left onto County 77 (Pine Beach Road). Go 13 miles. Take a Left on Sandy Point Road. Birch Bay will be straight ahead. Take 494 to 94 North towards St. Cloud. Take the Clearwater exit (Hwy 24) over to Hwy 10. Take 10 North to Little Falls. Take Hwy 371 North to Brainerd. Do not take Business 371 into Brainerd, stay on 371 to Baxter. Watch for the second stoplight after Cub and Gander Mountain. Take a left on County 77 (Pine Beach Road). Go 13 miles. DO NOT TURN AT AGATE SHORE DR SW - There is no longer access to the resort off this road. Take a Left on Sandy Point Road. Birch Bay will be straight ahead.